Trust and trustworthiness are the basis for taking decisions, certainly in a care setting involving vulnerable individuals. Within the scope of assisted living and community care, decisions entail, for example, sharing – often sensitive – personal data, providing access to devices or premises and contacting care professionals or family members. In case these decisions need to be taken – or at least supported – automatically by electronic devices, a basis of trust needs to be established electronically, as part of the system operation. The example use case that is addressed within the health domain concerns a frail person (the ‘resident’), potentially subjected to an accident, where the system needs to decide to select and delegate decision powers to a trustable person (the ‘responder’) in a secure way. 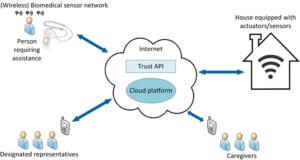 To that end, the system needs to monitor the resident, but also its own operation, and balance risk with a subjective notion of trust which can be aided by information and computation coming from cloud resources. Provide solution for secure trust-based delegation in assisted living and community care. This involves the actual delegation, how this is modelled and executed using some protocol on the one hand and the trust computation plus context evaluation that underpins the decisions on the other hand. Provide solution for automated context derivation for resident as well as potential responders. This involves wirelessly connected sensors monitoring the resident’s home, as well as his/her vital signs to assess personal health, wellbeing and trustable system operation. It also involves reliable and secure geolocation (enables spatial-based authentication) to help finding the most appropriate responder. Realize a demonstrator integrating the abovementioned trust-based delegation and automated context derivation functionalities, which showcases the combined functionality supporting the use case and therefore enabling validation of the concept from an end-user perspective. For the latter, stakeholder (e.g. focus group), as well as social science involvement is needed throughout the process to continuously improve the demonstrator with the end-user in mind.